Judicious use of technology and regular education can help minimize compliance risks. The Affordable Care Act. HIPAA. OSHA. If there’s one thing hospitals aren’t short of these days, it’s new rules. And for every fresh law or regulation that gets passed, new or updated policies follow, all of which must become familiar to staff members. Add in new technology adoption by way of EHRs or mobile health (mHealth), and you’ve got a sea of seemingly countless—and constantly changing—policies and procedures that overburdened employees must navigate daily. According to Meri Vangelas, senior consultant for advisory services at CTG Health Solutions, this evolving health care environment has changed the entire landscape of how policies and procedures are managed. “Think about it: Policies and procedures used to be written in a book and used for reference,” she says. “The influx of electronic information that directly impacts HIPAA has changed this into a living process where documentation and training are required on a regular basis. Simply keeping up with every new law or regulation update is obstacle No. 1 for most health care organizations, but ensuring policies and procedures are effectively rolled out to employees can be just as complicated, if not more so. “With the rapid pace of new and updated laws and regulations that providers must address, the task of ensuring that policies and procedures are up-to-date, available, and effective throughout the organization can be very difficult,” says Steve McGraw, president of SAI Global Compliance’s governance, risk, and compliance business, who notes that this can result in too many policies, many of which are ineffective because they’re either redundant or obsolete. In this storm of content, Hurd says hospitals must find a balance between ensuring employees know all the dos and don’ts and not bogging them down with harmful procedural overload. “From a content standpoint, it is vital to balance the prescriptive nature of policies and procedures to comply with applicable law and the need to assure comprehension so that health care staff modify their behavior to conform to such policies and procedures,” he says. “Too little detail creates confusion, while too much detail implies a ‘cookbook’ approach to health care and can harm individual professional judgment. Overemphasize following the rules and patient care could take a backseat. However, taking the rules lightly “can result in adverse consequences to patient safety—even patient death,” Hurd says. Using technology to push out new polices can help organizations target certain departments or individuals when necessary, he adds. Vangelas says the manner in which hospitals educate employees on the finer points of policies and procedures is key to long-term compliance. Through various learning methods, such as the classroom, webinars, and eLearning, education must concentrate on not just what needs to be accomplished but why, she says. For example, a simple explanation to staff on the impetus behind new privacy protections can increase student acceptance. According to Vangelas, work role-driven training is most effective when new laws or regulations emerge. 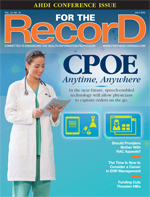 “For example, when new HIPAA rules come into effect centered on managing the patient portal, training geared toward specific staff functions from the front desk to clinical staff is crucial,” she says. Vangelas says a blended approach, which utilizes traditional classroom training as well as eLearning and webinars for added flexibility, works best in a large-scale training rollout. It’s a strategy that has worked for her in the past. “The training was all mandatory and there were required competency exams, but compliance was high and, more importantly, the providers and the staff were happy with the flexibility,” she recalls. In addition, he recommends placing online the actual policies and procedures (supplemented by the laws and regulations, where applicable), with a clear table of contents, glossary, and keyword search, to allow easy access when necessary. “Fumbling around to determine what to do next is often costly and can be fatal,” he says. Factor in the complexities that surround HIPAA rules and the harsh consequences of noncompliance, and Hurd says HIM also can help shape a hospital’s overall IT framework, not just the medical record. “Policies and procedures are components of the information exchange that must take place throughout the organization, and HIM serves as a vital hub for that exchange,” he notes. Jones says technology also can help determine employee comprehension. “To test employees’ understanding, you can send them an assessment based on the policies and procedures. These should be scored to track their understanding and areas that may need more education and identify areas of risk in employee compliance,” he says. Overall, Jones says, “When your staff is following policies and procedures, there are fewer chances for the auditor to find mistakes or wrongdoings, so storing policies and procedures in a place that staff can easily find is very important,” adding that the onus still is on hospitals to make policies and procedures a top priority. “Organizations must make it a priority for employees to understand policies and procedures,” he says, stressing that reviews simply are not enough.